There are several causes for an underarm rash or armpit rash and because of its location it is a very irritating type of skin rash for many individuals. If you are looking for other skin rash information, try the pictures of skin rashes page. A rash in the underarm area may be caused by an allergic reaction to the ingredients in the deodorant or antiperspirant being used. It may also simply be a chemical dermatitis skin condition caused by the chemicals in these products. Constant use of deodorants or antiperspirants leads to the skin possibly becoming sensitized to the chemicals and the skin reacts to this sensitivity by forming a rash. The treatment is to discontinue use of the products until the rash clears up, change to a different brand of product, or use the products less. The underarm or armpit area experiences a lot of heat build up. This can lead to a heat rash localized in the armpit area. Keep the underarm area cool and wear loose fitting clothing to prevent the underarm rash. Cotton materials are best or use breathable synthetics that wick moisture away from the skin area. An armpit rash may be due to a fungal skin condition or tinea. Because the armpit area is often warm and moist, fungus can thrive and cause a fungal armpit rash. To prevent a fungal type skin infection, keep the underarm skin cool and dry and ensure proper and regular cleansing of this area. See the section of Heat for more information on keeping this area dry. Shaving can cause an under arm rash. This skin area is sensitive and the act of shaving may cause irritation. Razor bumps may also form or a rash from ingrown hairs. To prevent an armpit rash caused by shaving, avoid shaving too close, avoid shaving over the same area often, and avoid shaving against the grain. Alternatively, if shaving constantly produces a rash in the armpit area, then perhaps an alternative hair removal method such as waxing or laser hair removal should be investigated. The constant rubbing of tight fitting clothes can lead to an armpit rash. Avoid regular use of tight fitting clothes. Other more general conditions may also cause an armpit rash as discussed at the diagnose my skin rash page. Note that additional treatments and medical advice other than the general recommendations outlined above may be required to alleviate the underarm rash. Consult with a physician if the rash is persistent, develops into some sort of infection, or if you have concerns in general. 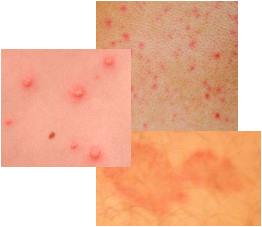 Visit the pictures of skin rashes page for additional skin rash information.